Although the Lewes Road area was not one of the slum areas of Brighton, the housing, dating mostly from the 1860s, was modest (A D Wagner owned 400 houses there) and Preston barracks were close by. The social composition of the area thus attracted his particular interest and a mission church was opened in 1867 (Maughan p65). After H M Wagner died in 1870, his sons built a permanent one as a memorial in 1874-75. 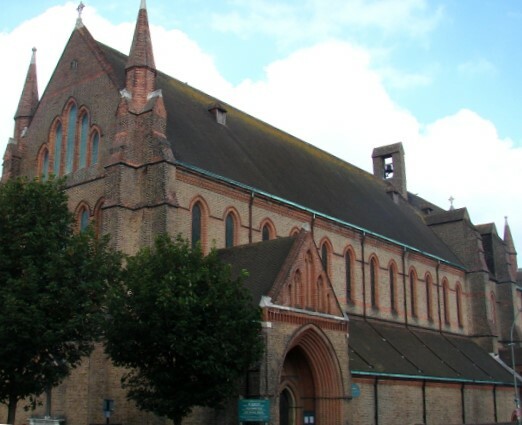 Apart from its parochial function, it was the barracks church until World War II. The architect was Somers Clarke junior (B 30 p852), whose father was closely associated with H M Wagner, though the son was then working in Westminster. At the same time as St Martin’s, A D Wagner was building St Bartholomew‘s and the two are linked. 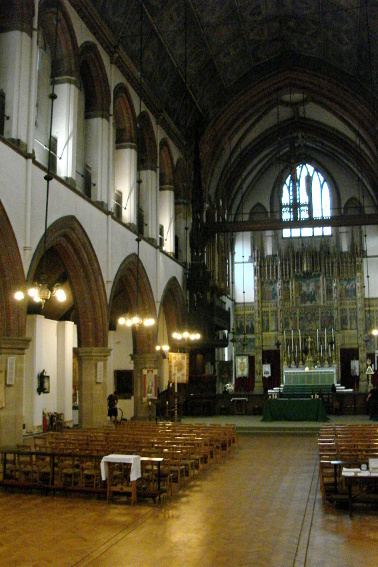 St Martin’s was the more conventional, though in fact larger than St Bartholomew’s in floor area. Particularly from the outside, it seems comparatively low, as it is mostly several feet below street level. According to Somers Clarke the street was afterwards built up (AR 45 p86), though a wish on the part of the town authorities to avoid a building that dominated its surroundings like St Bartholomew is said also to have played a part (Cocke p17). 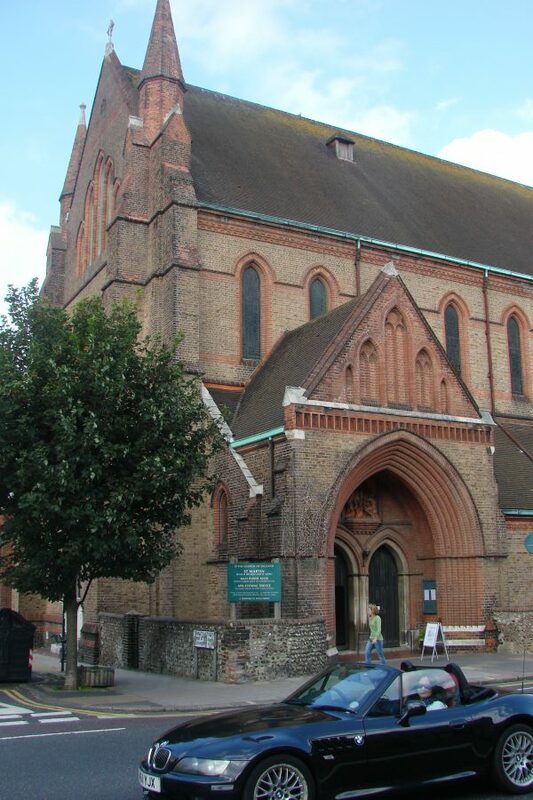 St Martin’s like St Bartholomew’s is built of plain brick with lancets. The low aisles are windowless, so the interior is lit by the clerestory and west and east windows, the latter set high to allow space for a reredos, with big niches either side. The west window is broader but the outer lancets on either side are blank. There is a big south west porch and a Lady chapel at the east end of the south aisle. A tower some 150 feet high with a saddle-back roof (Sawyer II p1) was intended to extend across the whole church between nave and chancel. The lack of this sadly compromises the exterior (the diminutive brick belfry was never intended to be other than temporary) and it is the interior for which St Martin’s is visited. 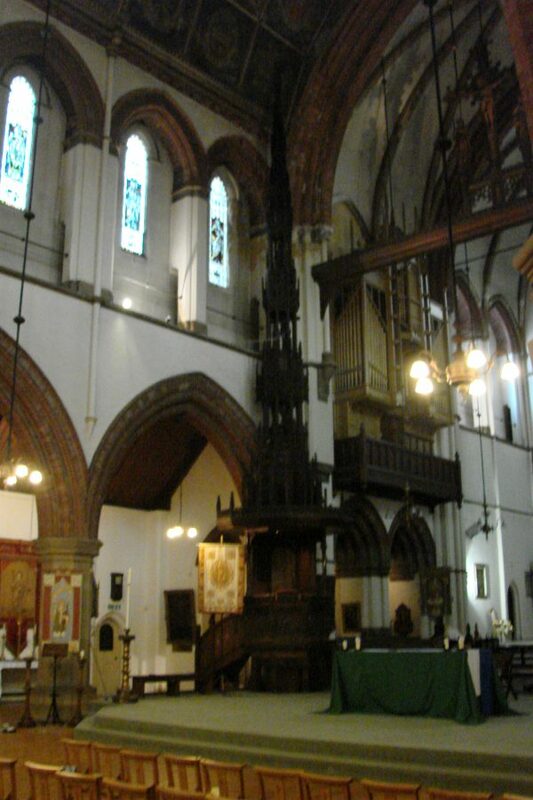 The west end is entered at street level with steps down to the body of the nave; its wood-block floor was one of the first of its kind (ibid p7). The clerestory is set in arched recesses, which are linked by a passage, leading to inevitable accusations that they led to monkish cells (ibid p6). The heads, like the arcades, are brick and contrast with the white walls; the effect recalls north German churches. However, the panelled wagon roof, painted with the arms of the then colonial and American dioceses, is more English in style, whilst the aisles have plain lean-to roofs. The chancel and intended tower-space, which is marked off by tall arches with shafts and moulded heads, have simple rib-vaults, but are otherwise barely differentiated, creating a single space. The internal walls of the aisles are divided by buttresses into shallow recesses, which are mostly empty, and the south chapel is vaulted. The baptistery is placed in the elevated area of the church at the west end. The effect is restrained and well proportioned, though clearly not cheap. By the time of its consecration in 1875 around £15,000 had been spent (B 33 p572). This included few fittings (see below) and Somers Clarke designed most over the next 30 years, with the close involvement of Henry Wagner, the youngest son. They contrast with the simple fabric. 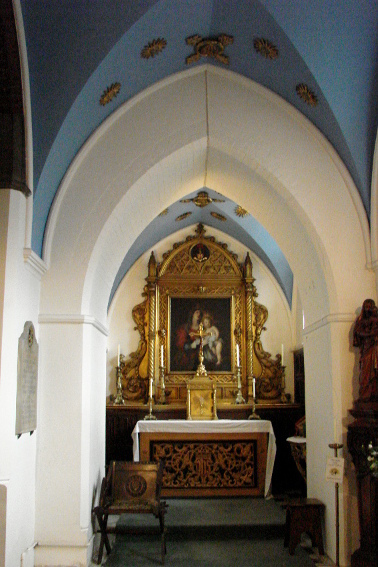 There have been few later changes; the Lady chapel was refitted in 1926 in a mostly Italianate style (2 p15), as was then preferred by many Anglo-Catholics, including the blue painting on the vault. The collapse of the belfry in 1997 caused some damage which was speedily made good without any attempt to create something more worthy of the church. Font: 1875. Octagonal bowl of Sussex marble, enriched with agates and other stones. Font-canopy: The large canopy by the architect dates from 1907 (WSRO EpII/27/99). It is in effect a domed baldacchino in the gothic style and is tall enough to accommodate a smaller cover on the actual font which probably dates from 1875. All the glass is by J Powell and Sons, designed under the close supervision of Henry Wagner. Most consists of single figures which were clearly intended to be seen from a distance. The east window (see below) is at a disadvantage because its crowded and small-scale design is hard to appreciate from floor-level. 1. (East window) Designed by H E Wooldridge, 1875, to complement the reredos, but too high up to be examined in detail. 2. (West window) Canopies by Somers Clarke and the figures by Wooldridge (AR 45 p37). 3. (Clerestory) 1885-86, (CDK 1886 pt 2 p148). This picks up the theme of the nave roof by depicting the various ‘apostles’ who brought the faith to new territories. The selection was wide and includes the Lutheran Hans Egede (1686-1758) who evangelised Greenland and is shown in the dress of his time. 5. .(South aisle, west window) . Also by Holiday (ibid), with four single figures of Anglican bishops. 6. (South chancel) Four lights, designed by — Read, 1904 (ibid). Lectern: Carved by J E Knox (1 p9). Pulpit: 1881 (B40 p30). Though on a marble base, it is of wood, carved by G Trollope and Sons (A 25 p18); four of the scenes are the work of M Rogers (CCL 1920). By no means small, it is dwarfed by the canopy by J E Knox (ibid), some 55 ft high. Lavishly crocketed and pinnacled, the model was German tabernacles, notably that at St Sebaldus, Nürnberg (Maughan p69). Reredos: 1875. Massive with pinnacles, it combines paintings and carving. The paintings are by Wooldridge and the canopies and other architectural carving by J E Knox (B 33 ibid). The figures are by J Mayr of Oberammergau, visited more than once by A D Wagner, who was interested in both the carvers and the Passion Play (1 p9). Rood and beam: Probably also by Knox, 1909. Sculpture: (Gable of south porch) Terra cotta relief of St Martin by J B Philip (ibid). War memorial: (South aisle, east end) Designed by Somers Clarke to commemorate those killed in the Egyptian campaign of 1882. The carving beneath the tiled inscription is by J E Knox, whilst the tiling is by W B Simpson and Sons (EH).